The central arched opening of the monument is supported by pilasters crowned with Corinthian capitals. Similar, but taller pilasters flank the outer corners. 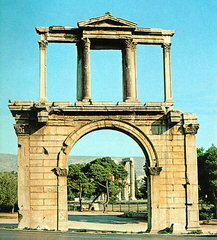 The arch is crowned by a series of Corinthian columns and pilasters, with an Ionic architrave at the ends, and an entablature with a triangular pediment in the middle. The whole monument is made of Pentelic marble.